Sphere: Any and all, though they appear in greater numbers in the Black Sea. Abilities: Kelpies are renowned worldwide, by many names, for their dreadful charm; with but a hypnotizing glance, they can soothe many a savage beast, as well as convince others that they are harmless. But once you get close enough to them, you see that they are actually skeletal in appearance, leathery skin stretched over bone, reeking of decaying flesh, with glowing eyes of bright red, and a mane of green kelp. Should it open its unnaturally hinged maw, it would reveal rows upon rows of jagged fangs. They are incredibly fast, with top speeds at eighty miles per hour, and when not hunting prey in the mortal realm, they often hunt in packs, shredding their often large prey with their teeth. Despite their speed and fangs, however, one must remember, they are skeletal by nature, and as such, are fairly easy to take down by blunt force. Despite this, however, they are rather immune to any sort of pierce attack, and would only be taken down by spears or similar sort, should they completely inhibit movement. Miscellaneous Notes: Kelpies are quite easily tamed, and make splendid mounts. They are intelligent, and while mute, communicate amongst themselves, and understand demonic. 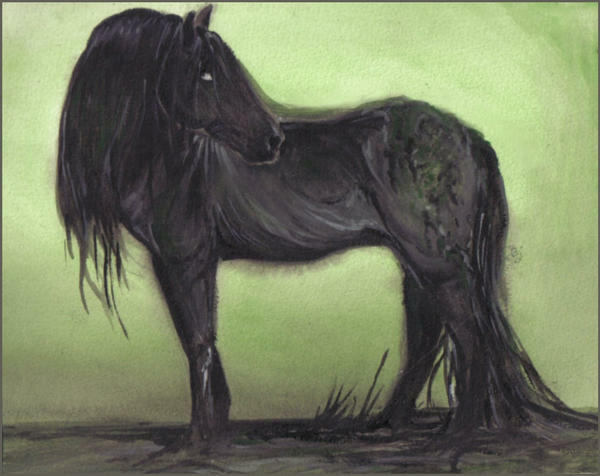 They tend to possess mortal horses, particularly the most gorgeous of ponies, in order to lure small children into lakes, where their mortal husk dies with the child, and they return to Inferis, with a fresh soul to devour. "Now I lay you, down to death, I pray the Lord, you'll be at rest, in death atoned, you are at ease, I pray the Lord, that he be pleased. Amen."